Lavandula (common name lavender) is a genus of 47 known species of flowering plants in the mint family, Lamiaceae. It is native to the Old World and is found from Cape Verde and the Canary Islands, Europe across to northern and eastern Africa, the Mediterranean, southwest Asia, China (Plectranthus mona lavender) to southeast India. Many members of the genus are cultivated extensively in temperate climates as ornamental plants for garden and landscape use, for use as culinary herbs, and also commercially for the extraction of essential oils. The most widely cultivated species, Lavandula angustifolia, is often referred to as lavender, and there is a color named for the shade of the flowers of this species. Lavandula stoechas, L. pedunculata and L. dentata were known in Roman times. From the Middle Ages onwards, the European species were considered two separate groups or genera, Stoechas (L. stoechas, L. pedunculata, L. dentata) and Lavandula (L. spica and L. latifolia), until Linnaeus combined them. He only recognised five species in Species Plantarum (1753), L. multifida and L. dentata (Spain) and L. stoechas and L. spica from Southern Europe. L. pedunculata was included within L. stoechas. The first major clade corresponds to subgenus Lavendula, and the second Fabricia. The Sabaudia group is less clearly defined. Within the lavendula clade, the subclades correspond to the existing sections, but place Dentatae separately from Stoechas, not within it. Within the Fabricia clade, the subclades correspond to Pterostoechas, Subnudae, and Chaetostachys. Thus the current classification includes 39 species distributed across 8 sections (the original 6 of Chaytor and the two new sections of Upson and Andrews), in three subgenera (see table below). However, since lavender cross-pollinates easily, there are countless variations that present difficulties in classification. Because the cultivated forms are planted in gardens worldwide, they are occasionally found growing wild as garden escapes, well beyond their natural range. Such spontaneous growth is usually harmless, but in some cases Lavandula species have become invasive. For example, in Australia, Lavandula stoechas has become a cause for concern; it occurs widely throughout the continent, and has been declared a noxious weed in Victoria since 1920. It also is regarded as a weed in parts of Spain. Lavenders flourish best in dry, well-drained, sandy or gravelly soils in full sun. All types need little or no fertilizer and good air circulation. In areas of high humidity, root rot due to fungus infection can be a problem. Organic mulches can trap moisture around the plants' bases, encouraging root rot. Gravelly materials such as crushed rocks give better results. It grows best in soils with a pH between 6 and 8. Most lavender is hand-harvested, and harvest times vary depending on intended use. English lavender (Lavandula angustifolia) yields an essential oil with sweet overtones, and can be used in balms, salves, perfumes, cosmetics, and topical applications. Lavandula × intermedia, also known as lavandin or Dutch lavender, yields a similar essential oil, but with higher levels of terpenes including camphor, which add a sharper overtone to the fragrance. Culinary lavender is usually English lavender, the most commonly used species in cooking (L. angustifolia 'Munstead'). As an aromatic, it has a sweet fragrance with a taste of lemon or citrus notes. It is used as a spice or condiment in pastas, salads and dressings, and desserts. Their buds and greens are used in teas, and their buds, processed by bees, are the essential ingredient of monofloral honey. For most cooking applications the dried buds, which are also referred to as flowers, are used. Lavender greens have a more subtle flavour when compared to rosemary. The potency of the lavender flowers increases with drying which necessitates more sparing use to avoid a heavy, soapy aftertaste. Chefs note to reduce by two-thirds the dry amount in recipes which call for fresh lavender buds. Lavender buds can amplify both sweet and savory flavors in dishes, and are sometimes paired with sheep's-milk and goat's-milk cheeses. Lavender flowers are occasionally blended with black, green, or herbal teas. Lavender flavours baked goods and desserts, pairing especially well with chocolate. In the United States, both lavender syrup and dried lavender buds are used to make lavender scones and marshmallows. Lavender buds are put into sugar for two weeks to allow the essential oils and fragrance to transfer; then the sugar itself is used in baking. Lavender can be used in breads where recipes call for rosemary. Lavender can be used decoratively in dishes or spirits, or as a decorative and aromatic in a glass of champagne. Lavender is used in savory dishes, giving stews and reduced sauces aromatic flair. It is also used to scent flans, custards, and sorbets. The greens are used similarly to rosemary or combined with rosemary to flavour meat and vegetables in savory dishes. They can also be used to make a tea that is milder than teas made with the flowers. The flowers yield abundant nectar, from which bees make a high-quality honey. Monofloral honey is produced primarily around the Mediterranean, and is marketed worldwide as a premium product. Flowers can be candied and are sometimes used as cake decorations. It is also used to make "lavender sugar". Lavender was introduced into England in the 1600s. It is said that Queen Elizabeth prized a lavender conserve (jam) at her table, so lavender was produced as a jam at that time, as well as used in teas both medicinally and for its taste. Lavender was not used in traditional southern French cooking at the turn of the 20th century. It does not appear at all in the best-known compendium of Provençal cooking, J.-B. Reboul's Cuisinière Provençale. French lambs have been allowed to graze on lavender as it is alleged to make their meat more tender and fragrant. In the 1970s, a blend of herbs called herbes de Provence was invented by spice wholesalers, where culinary lavender is added to the mixture in the North American version of the spice blend. Today, lavender recipes are in use in most parts of the world. Major constituents of lavender oil include linalool (26%) caryophyllene (8%). The essential oil was used in hospitals during World War I. Lavender oil is under preliminary research for its possible effect in alleviating anxiety and sleep disturbances. 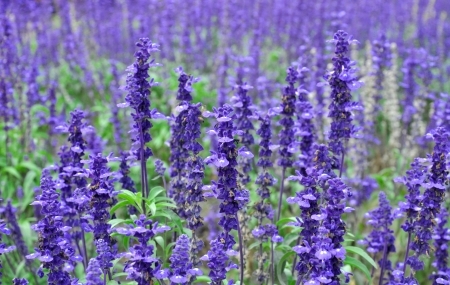 High-quality clinical research generally has not been done to conclude if there are effects of lavender oil on anxiety. The German scientific committee on traditional medicine, Commission E, reported uses of lavender flower in practices of herbalism, including its use for restlessness or insomnia, Roehmheld's syndrome, intestinal discomfort, and cardiovascular diseases, among others. The U.S. National Institutes of Health (NIH) states that lavender is considered likely safe in food amounts and possibly safe in medicinal amounts. NIH does not recommend the use of lavender while pregnant or breast-feeding because of lack of knowledge of its effects. It recommends caution if young boys use lavender oil because of possible hormonal effects leading to gynecomastia, and states that lavender may cause skin irritation and could be poisonous if consumed by mouth. A 2005 review on lavender essential oil stated that "Lavender is traditionally regarded as a 'safe' oil and, although it was recently reported that lavender oil, and its major constituent linalyl acetate, are toxic to human skin cells in vitro, contact dermatitis to lavender oil appears to occur at only a very low frequency." There are two reports on a total of six cases of gynecomastia in prepubertal boys who were exposed to topical lavender essential oil. A 2007 study examined the relationship between various fragrances and photosensitivity, stating that lavender is known "to elicit cutaneous photo-toxic reactions", but does not induce photohaemolysis. Lavender greens can be used in craft or modelling projects, such as the creation of miniature topiary or trees. nard and saffron, with henna and nard, nard and saffron, calamus and cinnamon, with every kind of incense tree, with myrrh and aloes, and all the finest spices. During Roman times, flowers were sold for 100 denarii per pound, which was about the same as a month's wages for a farm laborer, or fifty haircuts from the local barber. Its late Latin name was lavandārius, from lavanda (things to be washed), from the verb lavāre (to wash). I. Subgenus Lavendula Upson & S.Andrews subgen. nov.